Previously, I tried out the various dishes that the Galbi Bros. served during the one day pop-up night at Dead Dolls Club, London. You can check out the review here. For me, the best part is enjoying the street food. Eating warm food that just cooked from the food stall which is on the spot. The best part is enjoying these food while being in a joyful atmosphere. 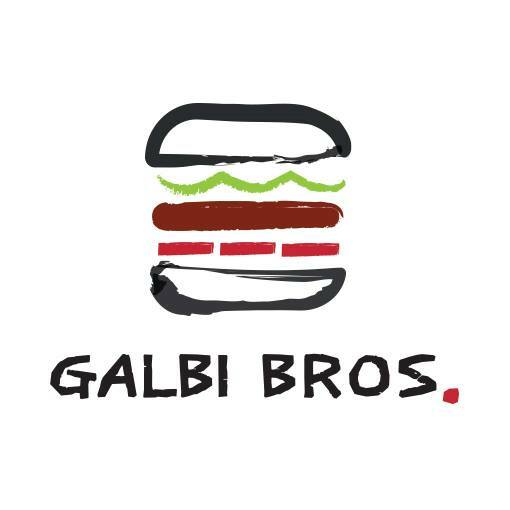 Thus, I decided to try the Galbi Bros. food in street food style. After I found out where exactly they were, I allocated my time to head over to Devonshire Square where the street food market is during lunch hours. 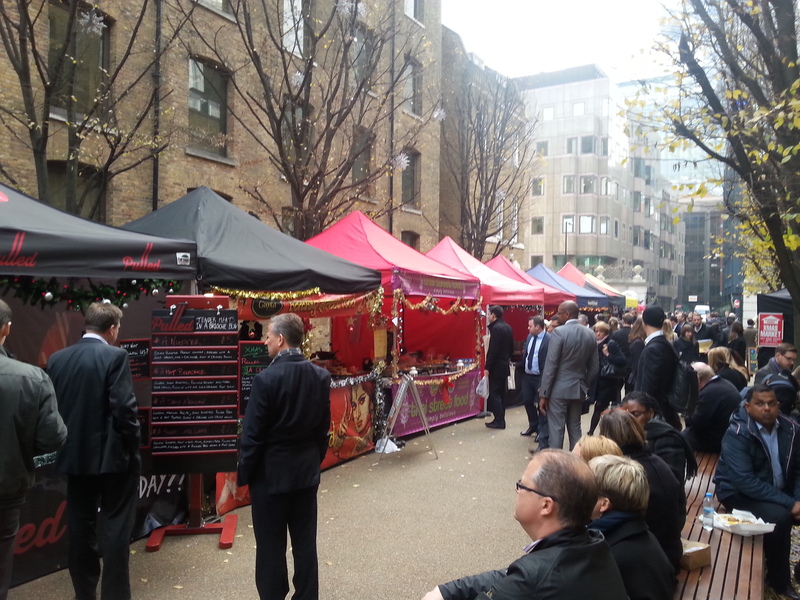 The atmosphere was Christmas-ey as there were a very small group of carol singers singing Christmas songs by the corner while the food stalls are selling their food speciality including the Christmas special foods. 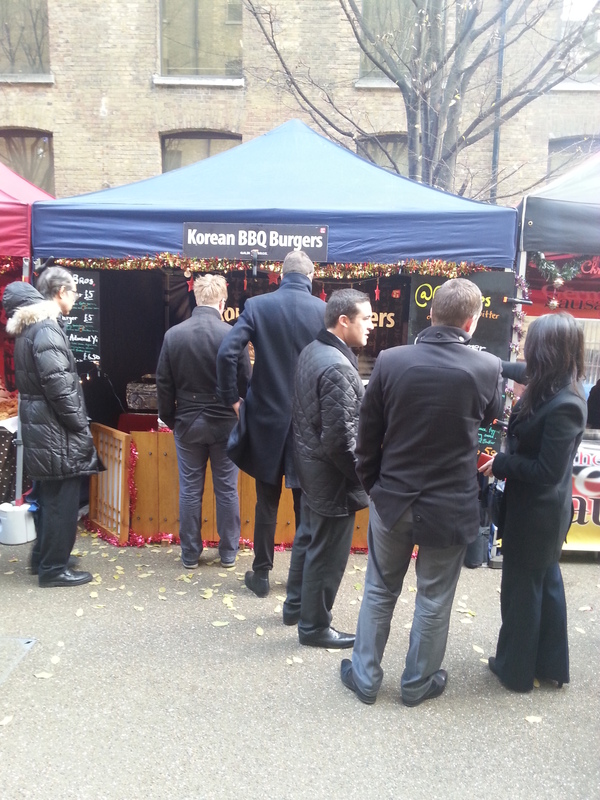 While being in a sort of Christmas atmosphere, I head towards the Galbi Bros food stall and there is already a queue as business people, who are on a lunch break, get their juicy meaty burgers. At the menu, you have three types of burgers to choose from. The very first burger which was introduced since the start of their business is the Galbi burger. The beef patty is marinated in the Korean galbi sauce. In this burger, it has fresh salad and the special Brother sauce. If you want to go something a little bit spicy, why not try the Don Burger which has the spicy pork belly which is marinated in spicy gochujang sauce. I aimed for the burger that a lot of people has been talking about: The Invincible Admiral Yi. While I was waiting for my burger, the big beef patties were sizzling away in the hot flat-top which made my mouth watering. Also, I could smell the spicy pork belly that made me excited to try this burger. 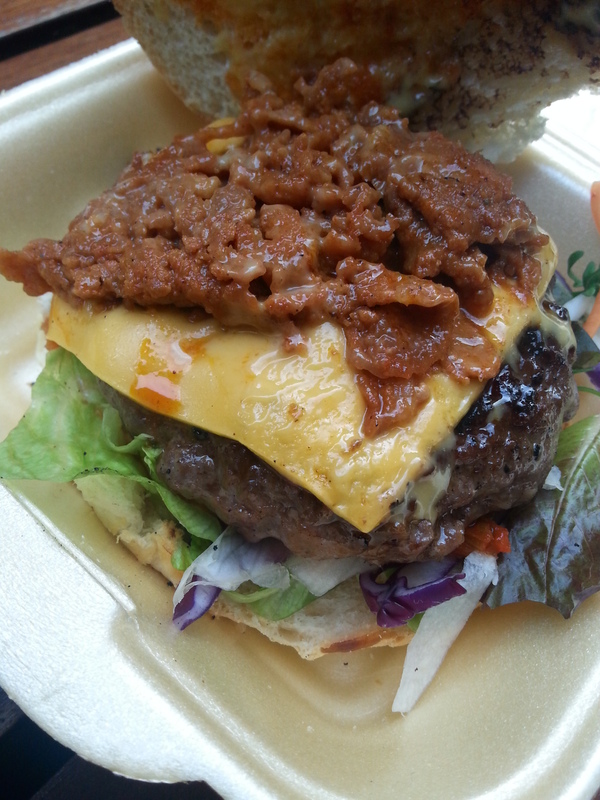 The ingredients were put nicely in the burger bun which was also cooked on top of the hot flat-top. To have this burger with a little bit of joyful Christmas, the kimchi-berry, which is mixed with kimchi and cranberry, is added into it. After having just one bite from the burger, the shocking blasts rushed through my tastebuds and mind. Its taste just led me in coming out with a “OMG” expression while I was filled with happiness and a little bit of joyful tears in my eyes. The Invincible Admiral Yi burger has a wholesome well-rounded flavours that blend well together in a warm burger bun. The taste from all the ingredients are balanced. Not too salty and not too spicy. Just the awesome balance of flavours. 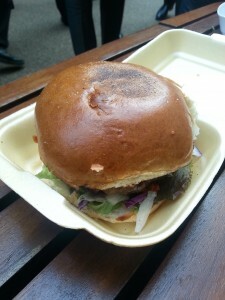 The beef patty was perfectly cook with mild galbi sauce taste. The bits of pork belly have a spicy kick but it’s not too spicy. The salad has the crisp of freshness. 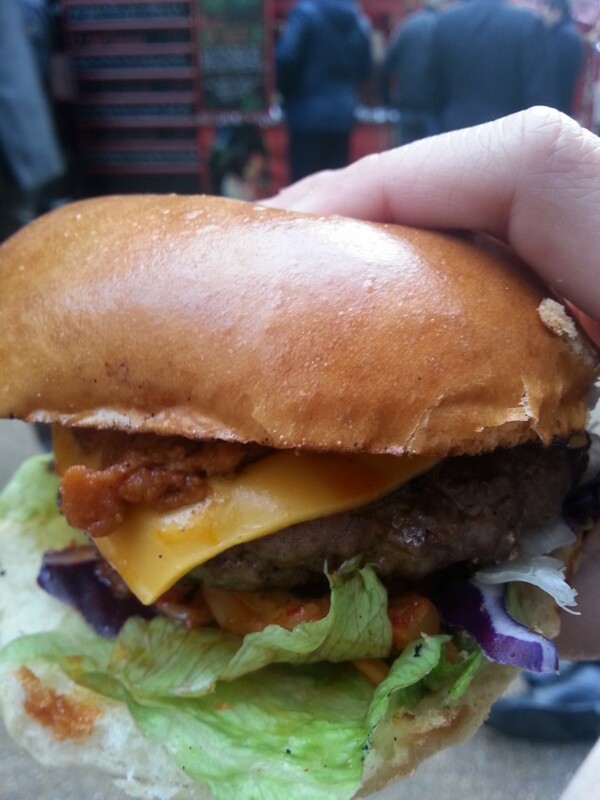 The kimchi-berry adds in a little bit of sweetness to the burger. The cheese melted perfectly in combining both pork and beef into a taste that is irresistible. The burger wasn’t that messy as the ingredients didn’t fall out a lot while I was eating. I felt that I was KO in the battle ring and Christmas songs were playing happily in my head. 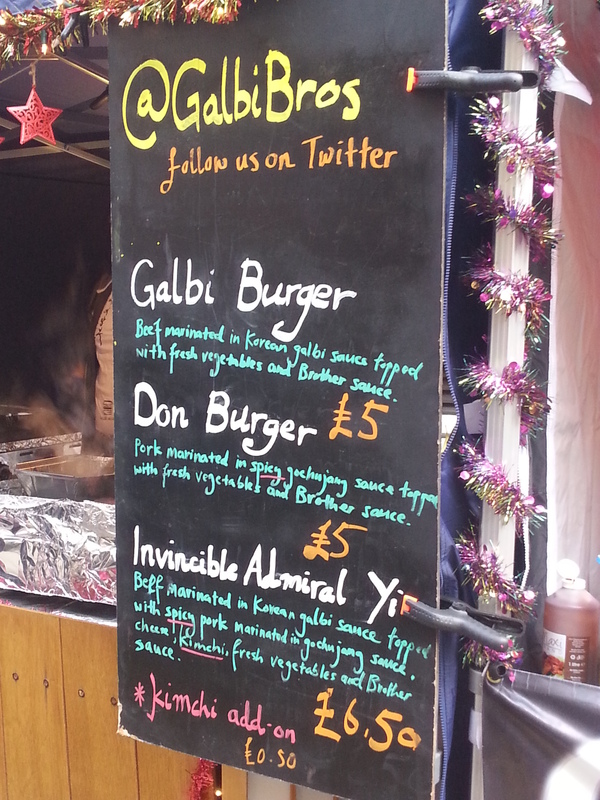 The Invincible Admiral Yi burger was so good that I will definitely visit the Galbi Bros food stall again in the near future. £6.50 for this burger is worth for its size and taste that I could enjoy eating. 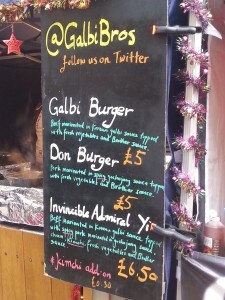 The Galbi Bros. will be at the Devonshire Square, which is near the Liverpool Street station, London, during lunch hours till this Friday. 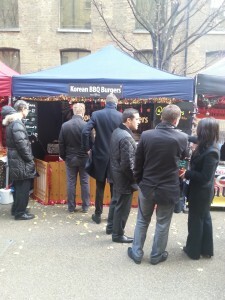 If you missed out, they will be at other places in London. To keep yourself updated and finding out where will they be next, follow them on Facebook and Twitter. For more information, check out their website.